TroLase is an UV-resistant acrylic based laminate for both indoor and outdoor applications. The laser engraving plastic sheets are specially engineered to produce maximum engraving detail at high speeds, whilst minimising residue and need for cleaning. TroLase Metallic is an acrylic based laminate with an authentic metallic finish. This laser engraving plastic is purposely engineered to deliver high detailed engraving at high production speeds and is available in a variety of colours, sizes and finishes. TroLase Metallic Plus is an acrylic based laminate with an authentic metallic finish. Benefiting from a thin top layer it enables detailed engraving at high production speeds. For external applications and cost effective, time saving alternatives to metal engraving, we recommend TroLase Metallic Plus which is UV-resistant. TroLase Reverse comprises of a transparent acrylic fascia with a coloured coating on the reverse side. By reverse engraving your image into the coloured layer you expose clear text/image which can either be infilled with your choice of acrylic paint or backlit for an effective contrast. As an additional feature the reverse has a third layer of black backing which significantly reduces the cleaning time and enhances the depth of colour. TroLase Thins are extremely flexible and ideally suited to applications on curved surfaces. With an acrylic base and thin foiled surface you can achieve detailed, elegant engraving accommodating both the trophy and award industry as well as the industrial market. New additions include solid white and black, proven medium for 3D model makers. TroLase ADA Signage is a solid, dyed, acrylic based material primarily used for the production of braille and tactile signage. With the added advantage of being UV stable it is ideal for functional signage in indoor and outdoor areas, for cutting out letters and for creating 3-dimensional signs. The thinner options are increasingly becoming a popular medium in the production of architectural model making. TroLase Textures are two-layer acrylic based materials, suitable for applications in demanding environments, where extra durability and scratch resistance are required. The textured, matte surface is non-reflective, durable and easy to clean. TroLase Textures are UV- and weather-resistant, suitable for indoor and outdoor use. A print receptive sheet, TroLase Digital Print is developed and designed for printing with UV and LED curing inks. The surface is pre-treated for superior ink adhesion. The core material is made of modified impact acrylic that makes it the perfect product for the combination for printing, laser engraving and laser cutting. TroLase Lights are a highly flexible UV stable robust film with an adhesive coating on the reverse. The self-adhesive film adheres perfectly to various materials such as metals, plastic, rubber and wood and makes it a popular material in industry and commerce. LaserFlex is a high quality, multi-layered polyurethane film highly suited for customising textiles. The laser can realise even the fi nest details with intricate motifs, which would be impossible to achieve with a cutting plotter. Once the motif has been engraved and cut out on the laser unit, the design is applied to the textiles using a transfer press. LaserFlex is characterised by good opacity and high elasticity. It is particularly suited to cotton, polyester and blended fabrics. Cast acrylic glass with a glossy finish, available in a variety of different colors and grades of transparency. TroGlass Color Gloss is a cast acrylic glass, both material sides have a glossy finish. The transparent, fluorescent and translucent colors offer constant light transmission superior to similar glass colors. TroGlass Color Gloss features all advantages of cast acrylic, especially in terms of impact resistance, light diffusion and handling capabilities. Cast acrylic glass with one matte and one glossy side. The “Night and Day” color variation allows for a change in color from black to bright when being backlighted in the dark. TroGlass Duo is a cast acrylic glass with one matte and one glossy side. These engraving acrylic sheets have a perfect light transmission and a high resistance to external agents, are UV-stable and weatherproof. They are very easy to work with, when laser cut, the product has elegant, polished edges. TroGlass Frosted is a heavy-duty cast acrylic glass with a matte, roughly structured surface on both sides (“sandblasted finish”). TroGlass Frosted is a heavy-duty cast acrylic glass with a matte, roughly structured surface on both sides (“sandblasted finish”), and this allows an anti-reflex surface. The frosted surface, combined with the intrinsic hardness of cast acrylic, allows applications where higher material strength and robustness are required. Our laserable acrylic sheets are easy to work with and UV-stable and weatherproof. TroGlass LED is a cast acrylic glass, optimized to LED light waves. TroGlass LED is a cast acrylic glass, optimized to LED light waves. This allows high light transmission and strong light diffusion while typical “spot effects” of LED lights are eliminated. These laserable acrylic glass sheets bring the light source nearer to the material, allow elegant, polished laser cut edged and are UV-stable and weatherproof. Cast acrylic glass with a particularly pleasant and elegant appearance due to a satin surface on both material sides. TroGlass Satins cast acrylic glass is available in a wide range of colors, in variations of transparent, translucent and non-transparent. All products have a matte, anti-reflective surface. Both engraving sheet sides have a satin surface that gives an elegant and soft feeling and appearance. Our acrylic sheets are US-stable and weatherproof. TroGlass Reverse is a transparent, cast gloss acrylic with a coloured coating on the reverse side. By reverse engraving the back and infilling the engraved areas with colour or backlighting an elegant finish can be created. As an additional feature the reverse has a third layer of black backing which significantly reduces the cleaning time and enhances the depth of colour. Clear cast acrylic for transparent applications. Plexiglas® is a clear cast acrylic and it is suitable for applications where excellent transparency is required. Your signage will really stand out with the new Cast Acrylics. They are harder and clearer than extruded acrylics and they allow you to perform fine, detailed engraving. TroGlass Mirror is the perfect alternative for glass. It has a higher resistance to breakage and is light. TroGlass Mirror is an extruded acrylic glass with a reflective surface. TroGlass Mirror is the perfect alternative to real glass because they are lighter and have a higher breakage resistance than glass, which means the material has a lower risk of falling and breaking when attached to a wall. TroGlitter is easy to cut and can also be engraved. The material is color stable with no bleaching or fading. TroGlitter is a cast acrylic that is mixed with glitter particles. TroGlitter offers massive opportunities for creative minds and designers, they can explore many different and interesting new visual effects. The base material consists of cast acrylic, similar to the TroGlass series, which means processing is very similar to our existing acrylic. Aluminum with coloured anodic coatings for laser and mechanical engraving. Anodised Aluminum is hard wearing, maintenance-free and adaptable for applications including signs, rating plates, control panel fascias and labels. The quality surface layer will not crack, peel or chip and can be exposed to sunlight with full UV stability. Coated aluminium in different colors for laser marking in black. 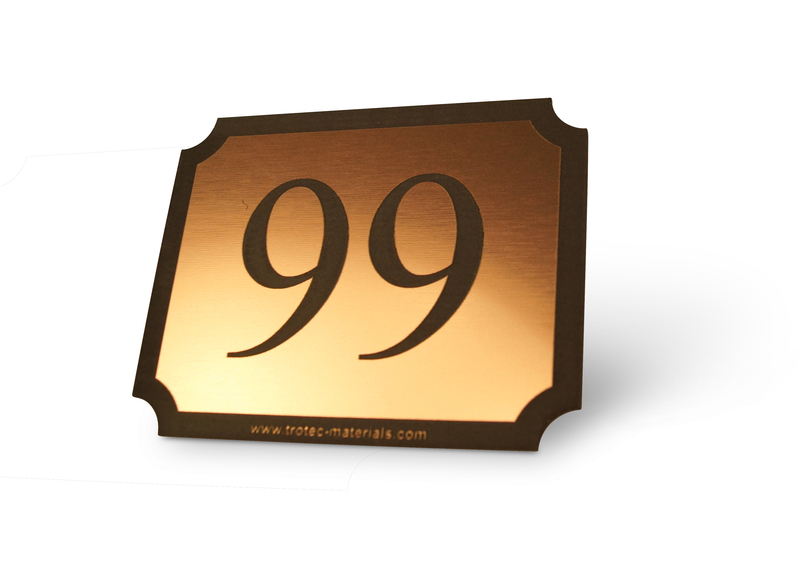 AlumaMark® is a specialised aluminium designed to be laser marked using lower power settings, it is ideal for the production of plaques, awards, signs and nameplates. Using a CO2 laser you can permanently create Black graphics beneath the anodised surface. Marking through thermal reaction enables half tone impressions, it is therefore highly suited for photographic reproductions. Ready to mark: no metal marking spray, tapes or additional processing required. Coated black aluminium for laser marking in white. DuraBlack® is a CO2 laserable matt Black non-reflective aluminium benefiting from an urethane protective top coat. Resistant to weathering, salt water, chemicals and high temperatures, it conforms to various industry and military standards including MIL-STD 130N, A-A-50271 (MIL-P-514D) and MIL-STD-15024F, Type L. Engraved, it produces an “A” grade high resolution White metallic contrast suited to bar coding and graphics. MDF fiber board panels with perfect laser cutting characteristics thanks to a high surface quality and homogenous fiber structure. The laserable and engravable MDF fiber board panels feature a high surface quality and homogenous fibre structure. The high fibre density allow for great results even in fine-detail laser cutting. Available in five luxurious finishes our solid wood panels are ideally suited for laser processing. Available in five luxurious finishes our solid wood panels are ideally suited for the requirements of laser processing. A sanded, matte and varnished surface offers an authentic high quality appearance and durability. Incredibly versatile our panels can be used for a multitude of applications such as small interior signage, interior decorations, fashion accessories and promotional giftware. Our laserable and engravable veneered wood is supplied with a formaldehyde free fiber board core with real wood laminate on either side. Sanded smooth and semi-matte varnished, they are suitable for a wide range of applications. Our plywood panels made from softwood are perfect for laser marking or engraving and available in different sizes. The laserable and engravable Plywood panels are made from softwood, combining lightweight characteristics with improved dimensional stability. The untreated, bright surface is ideally for laser marking or to be painted on. TroCraft Eco is an environmentally-friendly material made from pure wood fiber. It is is optimally suited for the laser process. TroCraft Eco is made from pure cellulose fiber, produced without additives, is fully biodegradable and is also emissions-free. Due to its low weight and easy processing, TroCraft Eco is perfect for interior design, model making or product and industrial design. This durable material can also be used for customized, modern designs given its stability, flexibility and formability. Paper which produces outstanding results when printed, laser cut and laser engraved. Ideal for invitations, brochures, business cards, scrap-booking and greeting cards. Trotec's Laser Paper is a laser friendly paper which produces outstanding results when printed, laser cut and laser engraved. Available in 13 different shades and a variety of GSM weights, Trotec's Laser Paper has been carefully selected to produce a high level of colour contrast when laser engraved and a crisp, clean edge when laser cut. Incredibly versatile, our Laser Paper can be used for a multitude of applications such as invitations, brochures, business cards, scrap-booking and greeting cards. We are glad to help! TroPly 's preeminent feature is its thin foiled surface which will enable you to produce intricate details swiftly without shadow effects. With a reflection free finish it is an ideal choice for an array of interior applications, particularly when a high degree of detail is required. TroPly Metallic provides the lustre of a real metal with a contrasting core. The foil surface enables fine line detail and cost effective processing, it is therefore perfect for trophies, gifts and awards. TroPly Metallic Plus has the added advantage of a clear seal application which creates a highly durable scratch resistant laminate maintaining the elegance of gold and silver, also highly suited to personal identification. TroPly Satins is supplied as standard with a brushed finish. An interior laminate with an extensive colour range, it is ideally suited to internal signage, nameplates, key tags and personal identification. The solid cap offers a highly durable and scratch resistant surface. TroPly Ultra is a UV non-glare modified acrylic laminate for internal or external applications. The thicker cap increases protection providing an ideal solution for harsh environments or external professional signage and directories. TroPly Ultra Reverse comprises of a matt clear acrylic fascia over a rich colour. An extensive colour range enables co-ordinated interior and exterior signage. Resistant to external influences, it is easy to clean and ADA compliant. Highly suited to directory signage and back-lighting. TroPly HiGloss is highly polished, lustrous in colour and UV stable, suited to both internal and external applications. A thick cap offers resistance to abrasion and whilst suited to mechanical engraving, its modified acrylic composition enables the added advantage of being able to cut intricate shapes using a laser. TroPly HiGloss Reverse is sleek and rich in depth of colour. A UV stable material, it lends itself to external signage and back-lighting, with the added benefit of the ability to produce 3D engraving effects. TroGlass Clear sheets are a great alternative to glass and Plexiglas as they offer perfect optical clarity. TroGlass Clear sheets are a great alternative to glass as they offer perfect optical clarity. At the same time they provide the physical benefits of acrylic such as being formable, UV-stable and hard-wearing. Laser engraving produces a white or clear engraved image, depending on the chosen settings. The laser cut produces polished cutting edges and inner contours, no additional post-processing of the material is required. Cast acrylic glass with a glossy finish, available in a variety of different colours and grades of transparency. TroGlass Colour Gloss is a cast acrylic glass, both material sides have a glossy finish. The transparent, fluorescent and translucent colours offer constant light transmission superior to similar glass colours. TroGlass Colour Gloss features all advantages of cast acrylic, especially in terms of impact resistance, light diffusion and handling capabilities. Cast acrylic glass with one matte and one glossy side. The “Night and Day” colour variation allows for a change in shade from black to white when being backlighted in the dark. TroGlass Frosted is a heavy-duty laser engraving acrylic with a matte, roughly structured surface on both sides (has a somewhat ‘sandblasted’ finish). TroGlass LED is a cast laser acrylic glass, optimised with LED light waves. Cast laser acrylic glass with a particularly pleasant and elegant appearance due to a satin surface on both sides of the material. TroGlass Satins cast acrylic glass is available in a wide range of colours, in variations of transparent, translucent and non-transparent. All products have a matte, anti-reflective surface. Both engraving sheet sides have a satin surface that gives an elegant and soft feeling and appearance. Our acrylic sheets are US-stable and weatherproof. A clear cast laser acrylic designed to be reverse-engraved and infilled/backlit for an elegant, professional finish. Clear laser engraving acrylic for transparent applications and needs. TroGlass Clear is a clear cast acrylic and it is suitable for applications where excellent transparency is required. Aluminium with coloured anodic coatings for laser and mechanical engraving. Anodised Aluminium is hefty, maintenance-free and can be adapted for applications including signs, rating plates, controls and labels. The quality surface layer will not crack, peel or chip easily, and can be exposed to sunlight with full UV stability without the risk of being damaged or discoloured. Available in five luxurious finishes our solid engraving wood panels are ideally suited for laser processing. Available in five luxurious finishes, our solid laser wood panels are ideally suited for the requirements of laser processing. A sanded, matte and varnished surface offers an authentic high-quality appearance and durability. Incredibly versatile our panels can be used for a multitude of applications such as small interior signage, interior decorations, fashion accessories and promotional giftware. Our engravable veneered wood is provided with a formaldehyde free fiber board core with real wood laminate on either side. Varnished so they’re smooth or even semi-matte, they are appropriate for a wide range of applications. MDF is a strong and cost-effective solution for a variety of applications. An extremely durable and versatile material for laser processing. Specifically engineered to create high quality black and red marks on a variety of substrates with a laser. The Spectrumark Technology (patent pending) delivers permanent, high contrast and high resolution marks on a wide variety of metals – using a common CO2 Laser. Spectrumark Laser Marking Inks are sold as a concentrated powder. This is very economical, easy to use and not classed as dangerous goods for transport. Spectrumark CM01D Concentrate for Metal creates high resistant markings on stainless steel, brass, copper, titanium, nickel, silver and other metals. Specifically engineered to create high quality black marks on a variety of substrates with a laser. Mark metal with a CO2 laser with our marking solutions. From sprays to tape we have the tools to create high quality marks on uncovered metals with a laser. Laser marking devices produce permanent black markings, which are highly resistant to mechanical and chemical stresses as well as high temperatures. Thermark and Cermark series laser marking materials are specifically engineered to crate high quality black marks on a wide variety of substrates. The contrast, resolution and durability of these marks make Thermark and Cermark ideal for barcoding, product serialisation, logos and decorative marking. MarkSolid is recommended for creating a black mark on almost any metallic surface. The liquid can be applied with a brush, foam or airbrush and the spray can does not clogg. Marking has a high chemical resistance, good abrasion resistance and good colour coverge. Choose from our large range of Antares Engraving Cutters suitable for rotary and mechanical engraving machines. Specially designed to use on laser engraved plastics our acrylic filler paints will not affect nor “craze” the lasered area. To infill metals we recommend our quick drying cellulose paint to create a permanent hard gloss finish. Blacking Fluid is a simple solution to create a contrasting mark on coated aluminium and brass. Any questions? We are glad to help! © Trotec Laser 2019 - All rights reserved.